Frances Hopkins, creator of the STEPABLES plant line gives advice about how to maintain STEPABLE plants in the garden. Every so often you decide a change in the game is needed. Either you determine it is time to change the game you are personally vested in called your life, or you determine your business needs an attitude adjustment. Either way, sometimes it is the one solitary move that seals your fate and dominoes a change so radical that the ripple is colossal. Well that was me 15 years ago. With one fell swoop, I changed the direction of my life and my business and nothing has been the same since. 15 years ago I developed whole new concept in gardening and changed how people all over the world look at plants on the ground. 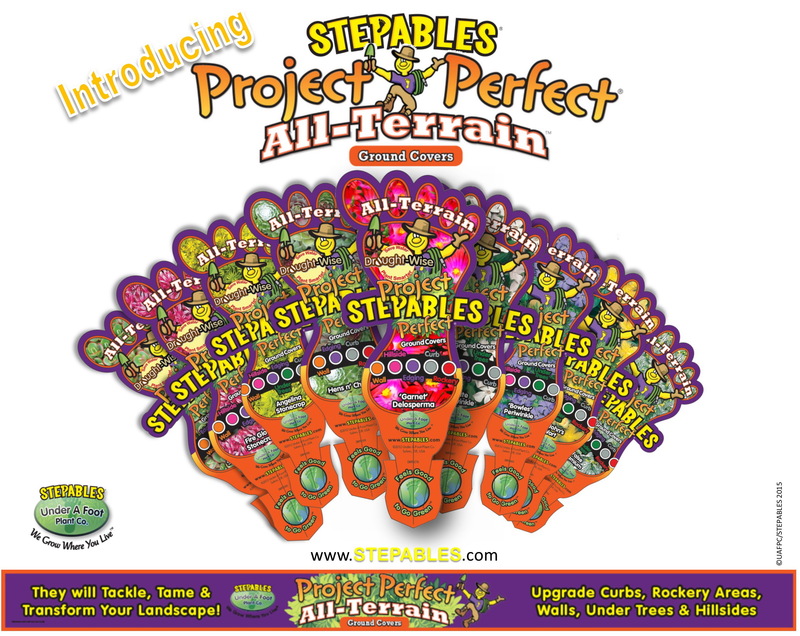 STEPABLE plants have revolutionized gardening. 15 years ago you could not find a book that said you could walk on a plant. In fact, the top rated ground covers books declared that foot traffic was not even advisable, stating the plants would never be able to withstand the pressure. Well, we proved them wrong! In fact, we proved that our plants actually grow BETTER when you walk on them!! So 15 years later, thousands of articles have been written on the subject, tons of gardening books now use foot traffic as part of a plant’s description, and dozens of copy- cat companies have sprouted up to take on STEPABLES as rivals. You might think this was one a one and done concept, but I wasn’t finished! For years the common verbiage was to call everything growing at ground level ground cover. However; since the inception of STEPABLES, I have always insisted on calling our genre of plant material creeping perennials. Why? Because not all ground covers are created equal! There is a huge difference between a plant used for a pathway and a plant used for a hillside! You can step on a thyme all you want, but ever try to walk on a hen n’ chick? Ha! They become a squishy mess! That is why we have spent the last 15 years honing our craft to bring you another exciting plant line. All-Terrains are our yin to our yang, our ebb to our flow, the salt to our pepper. Other companies have copied our plant list to fool consumers into thinking they have the same product, but they truly have no idea what they are doing with this category of plants…besides selling them. However, when I started STEPABLES, I had a vision. I saw a need for application marketing. I saw a need to teach, not just to sell. It’s not just about getting someone to buy a plant, it’s about solving their landscaping problem with the RIGHT plant. We have these amazing green heroes that people can use to find solutions to their landscape woes. These are not just pretty plants, but something that solves their real-life landscaping issues. These plants are problem solving, ecologically sound choices for today’s landscape. They have qualities that may include taking on some foot traffic, but for many others, their uses reach far more than being able to trounce on them to get your mail. So what’s the difference? Why does it matter? Ground covers can include just about everything you can plant in a landscape. From junipers to hostas, to sedums and ferns. The list is endless. They can range in all shapes and sizes, colors and textures, but most importantly, they range in an abundant amount of growth habits. 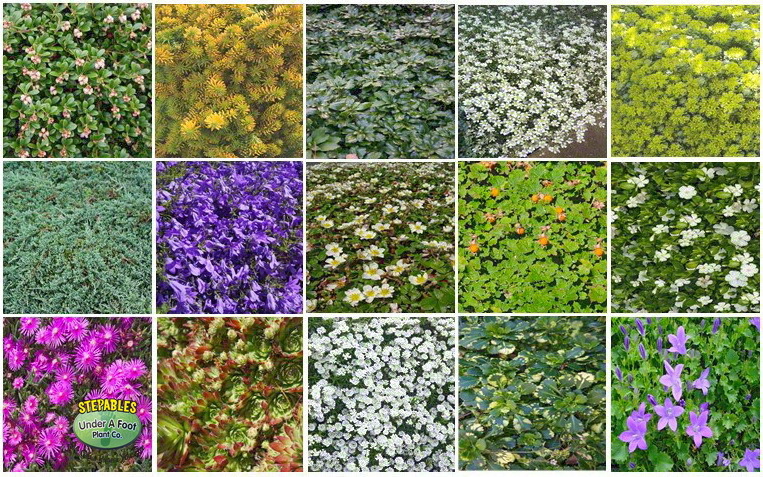 Fast or slow, short or tall, you can pick a ground cover that will grow 12”, 24”, some even 36” in a year. 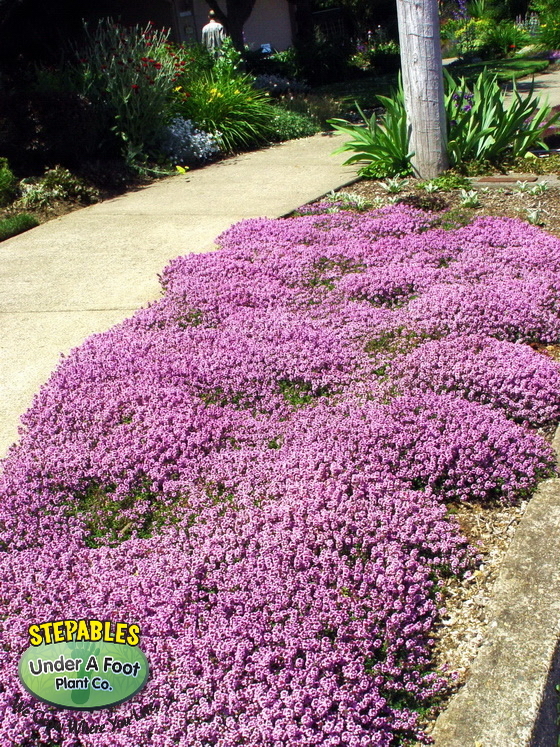 I’d like to see a creeping thyme do that!! Creeping perennials are more diminutive in style. Not so with a general ground cover. Ground Covers by their very name cover a lot of ground. The big question is…What kind of ground do you need to cover? Determining the purpose of your planting will be an enormous help in your mission to determine the right plant for you. Will you be planting a steep hill or a flat area? Do you need to plant for drought tolerance or is the area always damp? Is this a transitional area between you and your neighbor? Will you need to create a walk-though area or a complete division of space? Are you planting a simple pathway to your front door or a large patio area for your family to entertain? Are you planting a dry culvert by the road or one that fills with water every winter? Will you be planting a curbside hell-strip that you will hardly ever maintain or water, or will the area be used for your friends and family to enter your home? These are just a few of the questions one needs to ask to determine whether you need a creeping perennial or a ground cover. Creeping perennials can do just about anything and be put just about everywhere…but ask them to grow 24” in a year, or get 24” high and that would be far past their limit. 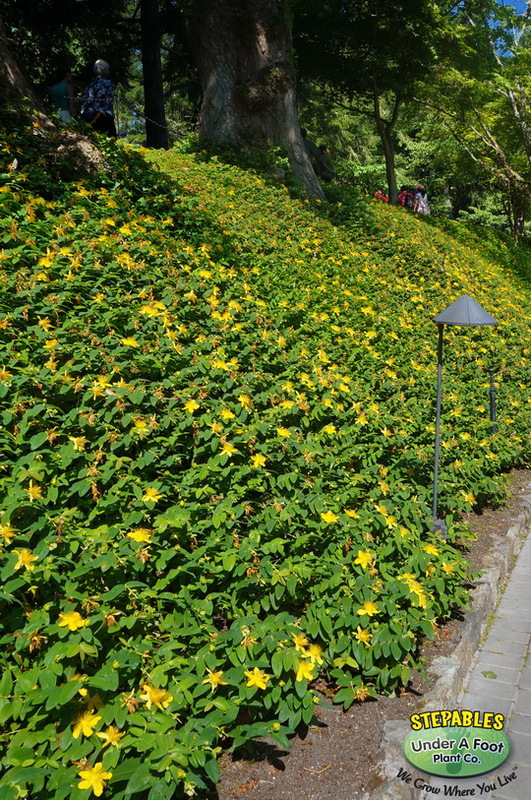 Just as a general ground cover can grow that tall and that wide per year, they will not stay small in stature. You can’t make a plant shrink and you can’t make it grow faster than it is genetically programmed to do. So you must know the difference between these two plant genres to be able to determine the right plant for your problem area. Neither side can accomplish all feats so you must educate yourself on the choices at hand to determine what the best plant option is for your particular landscape issue. Being knowledgeable about what type of plant you will need is critical. Understanding the differences between a creeping perennial like Corsican Mint and a general ground cover like Periwinkle is imperative. Corsican Mint will grow 1-2” inches high a year and spread 4-6” wide on average. Periwinkle can grow anywhere from 12- 18” high over a two year period, and spread 12-24” inches or more. Corsican Mint will take quite a bit of foot traffic and release a lovely fragrance, however, Periwinkle will not. The Periwinkle can take some foot traffic, but will not look pretty doing so. Water will run off Corsican Mint, but the Periwinkle will act as erosion control on a large hillside. Basically, Corsican Mint is no match for a steep hill, but it is a perfect fit for a garden pathway, as it will not grow too high and can absorb the foot traffic. 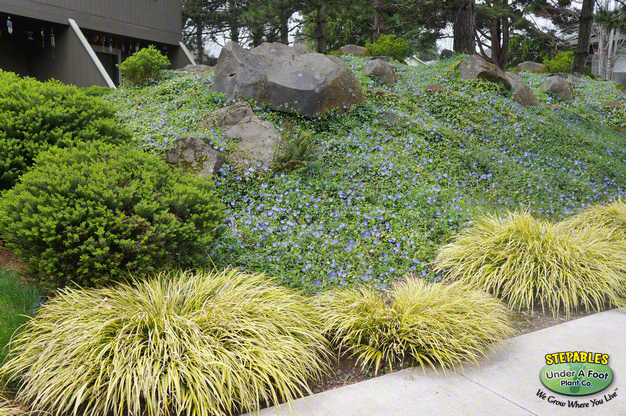 Periwinkle is perfect for a steep hill, but an absolutely horrible idea for a pathway plant. 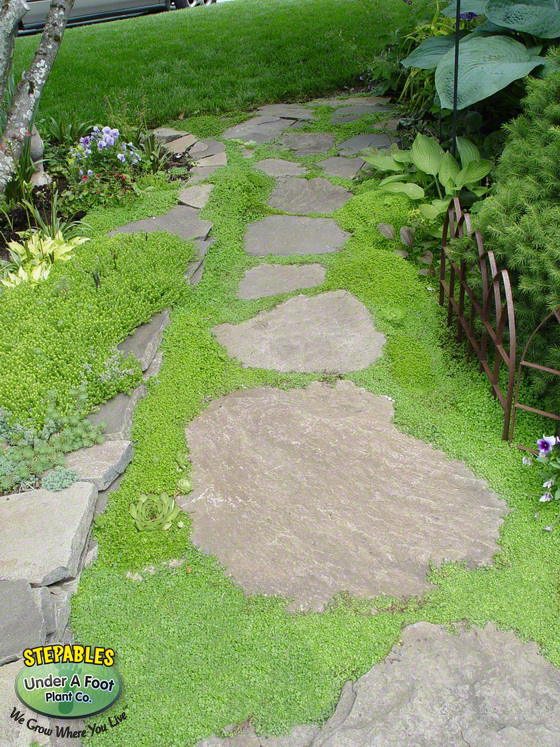 Ground covers and creeping perennials are wonderful plants to use in your landscape. They are the living carpet to your outdoor rooms. Knowing the difference between the two plant genres and planting wisely will lead to years of satisfaction from your beautiful handiwork. We think so. We are pretty big fans of any plant material that makes our life easier, brings about a sense of harmony in the landscape and creates an environment rich in creature activity, low in chemicals and high on beauty. 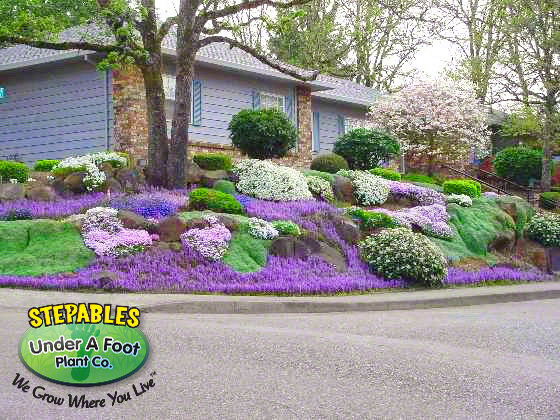 Combining STEPABLES and All-Terrain Ground Covers in your landscape will create the most perfect living carpet for your yard and turn any landscape into a Dreamscape! Stay tuned for more blogs on ground covering plants, and a new section of our website developing over the winter months that will become an invaluable tool for your landscaping needs. Now go get dirty out there! Steppin' Out With The STEPABLES Lady is blog about the passion of gardening and the connections we all share while we are on this planet. Our lives are surrounded by plants and by people. This is a blog about how one person tries to figure it all out and balance the day to day world of gardening with the day to day world of family, friends, and career...and how they seems to all come together in the garden.